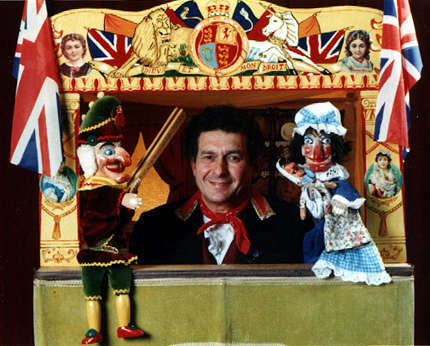 Professor Bob Sacco is the Honorary Secretary of the Punch and Judy Fellowship and an international Punch Showman of wide experience and excellent reputation. He has been interviewed about Punch on radio and TV and has arranged and organised a number of Punch and Judy Festivals and conventions. Bob's wife, Anne, is counted among the best of the country's children's entertainers. She is a skilled puppeteer, magician and ventriloquist and often fronts Bob's show as his "bottler". Both Bob and Anne appear in costume suitable to the occasion. Bob Sacco has an Honours Degree in Education and is a very experienced and professional lecturer of many years standing. 'The Life and Times of Mr. Punch' is a highly entertaining and educational illustrated talk on the history, traditions and development of the Punch and Judy Show. It traces Punch's origins and travels from Ancient Rome via the italian and french Commedia dell'Arte across the channel to Restoration England and through the Regency, Victorian and Edwardian periods to the present day. Puppets and masks combine to bring the talk vividly to life in the hands of the Professor. As presented with great success at the Thalian Hall, Wilmington, North Carolina and the Arts Club in London. Ideal for colleges, schools, arts centres and festivals, libraries and similar organisations.